Text: 490 pp Veranderte Russland , includes Lorenz Langes: voyage to Beijing ; Muller, J B: Leben der Ostiaken and pp 445-482: Description of Saint Petersburg (with the folding map) ; 3nn lvs (=index). 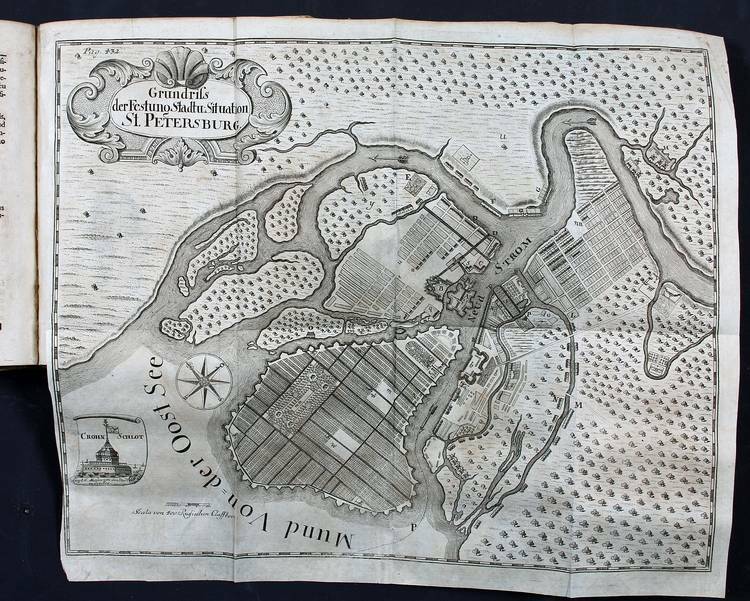 The map of St Peterburg is early, rare and important. According to Bagrow the first map of the area where St Petersburg would rise was mapped by Gossler in 1703. In 1713 Tsar Peter decided to move the Russian capital there. In 1715 the establishment of the Naval Academy in St Petersburg intensified surveys of the Russian coast of the Baltic Sea. The design of Vasiljew island crossed by channels within the setting of a city in the Neva delta was first printed in Paris by de Fer in 1717. A similar plan is found in the various editions of Weber). This map is undated (but proper to the very first Weber edition!! ), the text in the map is in German, the page indication is 432 (and it is bound after page 444) and it has a little inset with Crohn Schlot, a curious variation of Crohn Stadt used in the earliest days of its construction under Admiral Cruys.